The Cotton Board unveiled its new Forever Cotton campaign during the Southern Cotton Ginners Association annual meeting and Mid-South Farm & Gin Show in Memphis. The Cotton Board and its brand communications agency Archer Malmo worked together to create a national integrated and visually-appealing campaign that showcases how cotton continues to be viable in the marketplace through research, innovation and promotion. “We wanted Forever Cotton to demonstrate to U.S. growers that we’re working on their behalf to ensure cotton continues to be successful in the marketplace, while also showcasing how diverse the crop is,” said Cotton Board Director of Communications Stacey Gorman. Cotton within cooking, with restaurants like Cafe Du Monde in New Orleans showcasing their beignet secret ingredient – cottonseed oil. Cotton within farming, by following the lives of a farming family from West Texas, who tells the sustainability story of their land being passed down from generation to generation and their role on producing more fiber and more seed from less inputs. 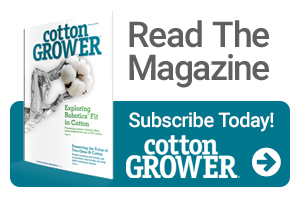 The Forever Cotton national campaign is running in both print and digital, and the video series can be viewed on The Cotton Board website, Facebook and YouTube pages.